As a member of the B-complex family of vitamins, Vitamin H is probably better known by its other names, Biotin and Vitamin B7. Vitamin H is a water soluble vitamin which means that the body passes what it does not use through the body via the urine. Unlike the other vitamins which the body gets from food, this vitamin is produced inside the body by bacteria that live in the large intestines. Since daily requirements are low, and since so many foods contain it, and since the body naturally produces it, Vitamin H deficiencies are rare. 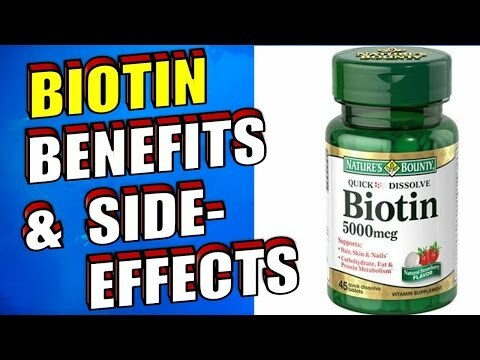 One of Biotin's primary responsibilities is to ensure proper growth. It assists in the production of DNA, RNA and nucleic acids. Cells in particular rely on this vitamin to help them grow and replicate properly. The body needs Vitamin H to help with the production of fatty acids. The tissues of the nervous system and the muscles benefit from Vitamin H and it is important in the production of bone marrow. Biotin also assists in the process involved with the transfer of carbon dioxide. As with the other B vitamins, Vitamin H also plays an important role in metabolism of carbohydrates, fats and proteins. It also helps process glucose. The end result is that the body is able to efficiently produce energy, eliminating problems associated with fatigue. Biotin helps blood sugar levels remain steady. People with diabetes may find Biotin beneficial because it has been known to increase the body's reaction to insulin. Believe it or not, Vitamin H plays a role in helping to keep hair from turning gray and also from falling out. It helps keep fingernails strong and less prone to brittleness by encouraging nails to grow thicker. Biotin helps keep skin healthy, too. Biotin must really be effective because many beauty products list this vitamin as an active ingredient. It is also possible that Biotin can help relieve the symptoms associated with depression. And finally, it may also help reduce pain. Vitamin H is found in meat, especially organ meats (liver and kidneys), dairy products (milk, cheese and butter), egg yolks, oysters, lobster, poultry, cauliflower, avocados, bananas, strawberries, watermelon, grapefruits, raisins, mushrooms, green peas, blackcurrants, brewer's yeast, wheat germ, nuts, beans, lentils, oat bran, whole grain breads, oatmeal, peanut butter, molasses and foods high in Omega-3 fatty acids including salmon, tuna, mackerel and herrings. Eating raw eggs can lessen the body's ability to absorb this vitamin. The recommended daily intake of Vitamin H (Biotin) is 300 micrograms for healthy adults and pregnant women. Women who are breastfeeding need a bit more, about 350 micrograms/day. As stated above, this type of deficiency is very rare. However, that does not mean the problem is nonexistent. Several symptoms could indicate a deficiency in Vitamin H. Possible symptoms include a scalp that is dry or scaly, a loss of appetite, a loss of hair, nausea, muscle pain, fatigue, depression, dermatitis, anorexia and anemia.